Funding is also provided by Fort Tryon Jewish Center as part of its ongoing support for the community eruv. The Mount Sinai - Heights Eruv is noted in Purple (left) in the map. This eruv borders the YU eruv, indicated in blue (right) in the map. YOU MAY CARRY BETWEEN the two eruvin. Please visit www.yueruv.org for the details of the YU eruv. Along Broadway, above 187th Street the eruv extends ONLY on the WEST side of the street. On Fort Washington north of 730 Ft Wash (the last bldg) you may walk ONLY on the WEST side of the street. On Wadsworth, below 182nd Street, the eruv extends ONLY on the WEST side of the street. The Ft. Tryon Gardens buildings on Bennett north of 192nd street may be accessed only from the entrances on 192nd or Bennett. DO NOT enter or exit those buildings from Broadway. On 181st Street, the eruv ends at the entrance to 867 W 181st St (between Cabrini and Haven). The rest of the street (going west), is outside the eruv. 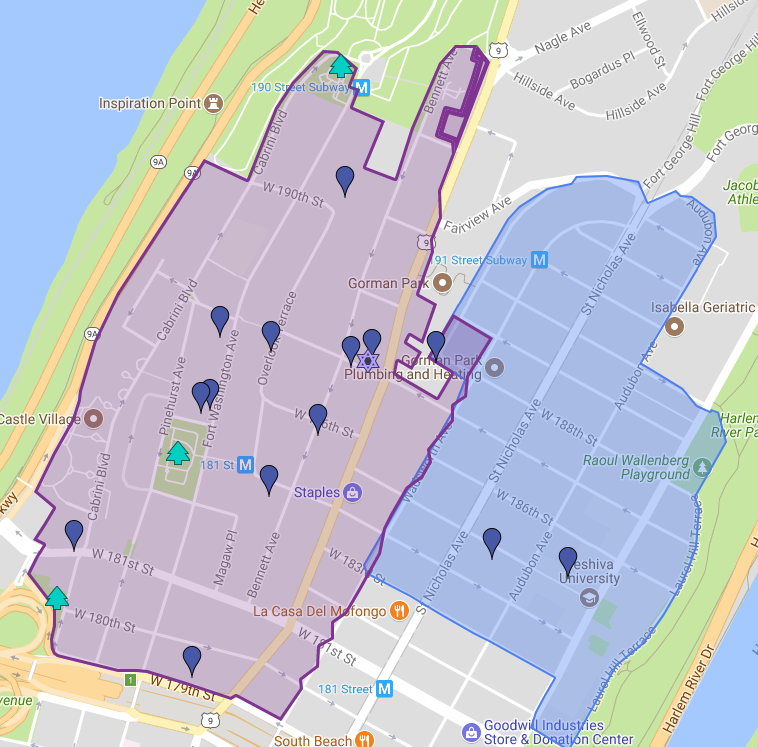 Fort Tryon Park, Gorman Park and Margaret Corbin CircleARE NOT IN the eruv. The stairs on Fort Washington that go down to the A train near the entrance to Fort Tryon Park ARE NOT IN the eruv. The park that they lead to is also not in the eruv. Javits Park, on the North-West corner of 193rd and Fort Washington, is in the eruv. North of 192nd, you should not walk on the east side of Fort Washington). Dolphin Park, on Cabrini between 180th and 181st, is in the eruv. Please contact the eruv committee or the Rabbi with any questions regarding the boundaries of the eruv.